In the past, you’d need to purchase a home gym if you wanted to get a thorough workout, but that can be very expensive. If you didn’t want to buy your own equipment, you’d have to get a gym membership. For the average person, a gym membership isn’t worth it, because you’d need to go to the gym nearly every day to get your money’s worth. Instead, many people search for the best resistance bands they can find. They’re easy to store, relatively inexpensive, and intuitive to use. It’s gotten to the point where many people completely forgo all other equipment in favor of solely using resistance bands. 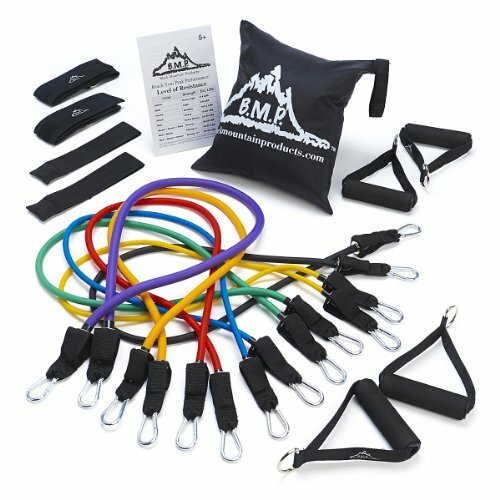 Black Mountain Resistance Band Set 4.7 / 5 $$ More details! Bodylastics 12 Piece Resistance Band Set 4.7 / 5 $ More details! ProSource Xtreme Stackable Bands 4.4 / 5 $ More details! Bodylastics 19 Piece Strong Man Set 4.8 / 5 $$ More details! Bodylastics 28 PCS Set 4.7 / 5 $$$ More details! Resistance Loop 4.9 / 5 $ More details! Aylio Loop Fitness Bands 4.5 / 5 $ More details! Not many people know that resistance bands weren’t created for general fitness or strength training. They were originally used for low-stress muscle rehabilitation and physical therapy. Patients who had recently gone through surgery would use resistance bands to get their strength back. Physical Therapists especially liked using resistance bands because they don’t cause as much strain as using dead weights. When using a band, the resistance starts at a low weight, and gradually increases to its full weight potential. This way, there’s less of a chance that you’ll injure yourself by trying to pick up a weight that’s too heavy. To this day, physical therapists still use resistance bands during their therapy sessions. Resistance bands have become an integral part of the average workout. If you’re a fitness enthusiast, there’s a good chance that you’re already familiar with resistance workouts and band types. The Black Mountain Ultimate Band set is a great package for anyone who’s starting out or wanting to upgrade. The set includes all the essential bands that you’d need for a thorough workout. The package comes with a starter guide, which will guide you through some basic workouts with the resistance bands. Even if you’ve never used resistance bands before, the Black Mountain set has enough bands and guides to last you a lifetime. 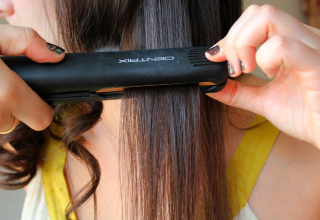 Unlike other models, the handles do not come attached to the bands. The Black Mountain has detachable handles, so you can move them from strap to strap during your workout. This design is much stronger, so your resistance bands will last much longer than other brands. If you need a greater resistance during your workout, you can stack the bands to get up to 75 pounds of resistance. This is very useful for advanced strength training, along with regular workouts and physical therapy. Some customers say that the ankle straps don’t have enough padding to comfortably use on bare skin. The manufacturer recommends wearing the strap over your socks to minimize discomfort and enhance your workout. The Black Mountain resistance bands set is a top seller, and popular with exercise enthusiasts everywhere. The package has received an amazing number of four and five out of 5 ratings from satisfied users. Many people say they feel that they’ll never have to buy another package of resistance bands because the Black Mountain bands will last them a lifetime. 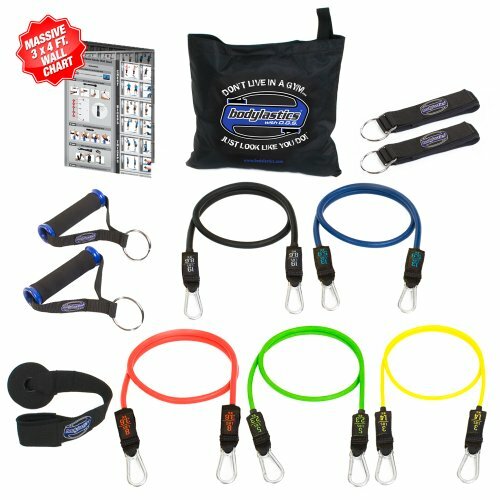 The Bodylastics 12 Piece Resistance Band set offers a professional-grade resistance band kit at a great price. All of the bands are dipped in heavy-duty latex, which minimizes the risk of breakage after extended use. Along with the latex exterior, the interior of the bands is made from a flexible, woven cord. This way, the interior will be fine if the exterior is damaged during its lifetime. Bodylastics brand resistance bands are used by the United States military and law enforcement agencies for strength training. 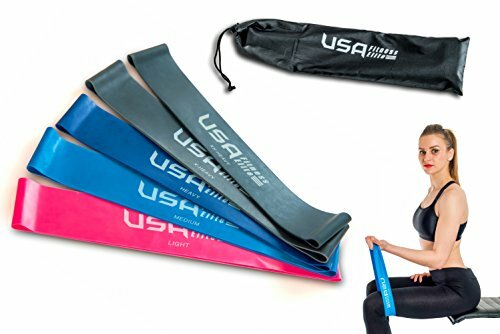 You have access to the same bands that are trusted by millions of Americans who rely on their resistance bands to keep them in the best shape possible. The O-ring on the handles is made from high-quality iron, so it won’t shatter or break under extended use. The clips to attach the resistance bands are located on the bands instead of the handles, so the handles could be built without any weak points. Some users have said that they have some difficulty using the heaviest bands for regular workouts. For the most part, users tend to stick with the three lightest bands for their standard exercises. The Bodylastics 12 Piece set is very popular and has a large amount of dedicated users. Over 90 percent of all customers give the package a rating of four out of 5 or higher. This makes the Bodylastics 12 Piece one of the top-rated resistance band packages currently available. While some of the other resistances bands we’ve mentioned have dipped their cords in latex to prevent ripping, the ProSource Xtreme double-dips all of their resistance bands to ensure user safety at high tensions. Along with the standard set of three resistance bands, the Xtreme package comes with a set of clip-on handles and a door anchor. The ProSource Xtreme is ideal for weight training. The three high-weight bands can be stacked to offer a combined 105 pounds of resistance. 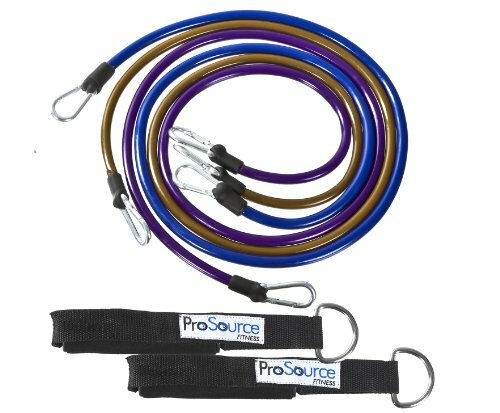 If you’ve used resistance bands before and want to upgrade to a professional-grade set, the ProSource Xtreme is an excellent option. The package comes with a compact carrying case, and the bands are light enough to take with you on trips without difficulty. As long as you bring the door anchor with you, you can use the ProSource Xtreme resistance bands almost anywhere. The package doesn’t come with any low-tension bands. The lightest band is 25 to 30 pounds, which isn’t well suited to a standard workout. It’s a good idea to buy additional lightweight bands, so you can have a more varied collection of resistance bands. If you’re tired of carrying around heavy dumbbells and want to make the switch to resistance bands, the ProSource Xtreme is a good choice. These bands are great for anyone who’s familiar with weight training, and isn’t reaching their full potential with regular exercises. The band’s sturdy latex construction will provide users with years of reliable exercises that they can use for advanced weight training. Another popular product by Bodylastics, the 19 Strong Man package comes with all the equipment an exercise enthusiast will need to get started with weight training. The package comes with 7 anti-snap bands at a variety of different weights, 4 heavy-duty handles, 4 ankle straps, and 4 door anchors. Many customers purchase the set so they can work out with a friend or without spending too much on separate sets. The 19 Strong Man package comes with some of the strongest resistance bands made by Bodylastics. Each of the bands has a high-tension ABS core that’s dipped in latex to prevent them form wearing out during regular use. The coating also helps prevent damage from over-stretching during intense workouts. The Bodylastics 19 Strong Man package comes with enough bands for any type of workout. The bands can be combined in any order to offer over 200 pounds of resistance, which is more than the average user will ever need during their workout. Some customers have mentioned that the low-tension straps don’t have consistent pull weights. The high-weight bands pull smoothly through the entire motion, but the low-weight bands can be harder to use effectively. 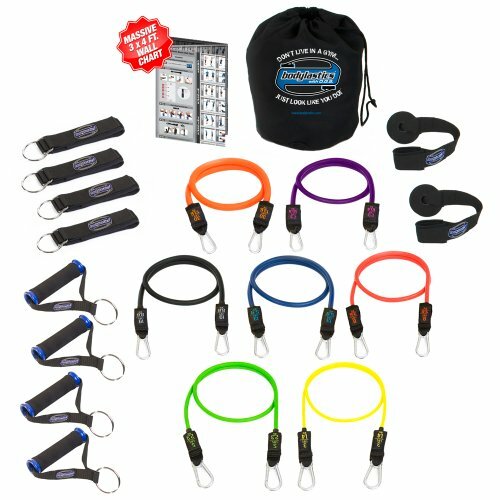 If you’re looking for the definitive resistance bands set by Bodylastics, the Strong Man 19 piece set is a great choice. It’s a big hit with weight trainers everywhere, and many users have completely abandoned their traditional weights in favor of the Bodylastics resistance bands. The third and final package by Bodylastics on this list, the 28 PCS resistance band set comes with 12 anti-snap bands and offers a complete workout. 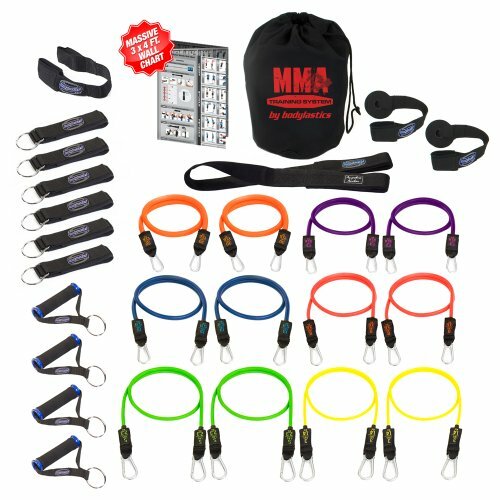 Branded as their MMA training kit, the 28 PCS set can be used for a lot more than MMA training. If you’re doing any kind of weight training, the Bodylastics package will work for you. Bodylastics uses industrial-grade material when manufacturing their straps, which makes them extra strong. Even if you had a knife or a pair of scissors, you’d find it very difficult to cut through the high-quality cords. Bodylastics bands will remain stretchy and responsive after years of hard use, which makes the 28 PCS an ideal investment. The package comes with enough handles and ankle straps to equip five people at once. If you work out at home with friend or family, then the Bodylastics 28 PCS package offers enough resistance bands and equipment for everyone. 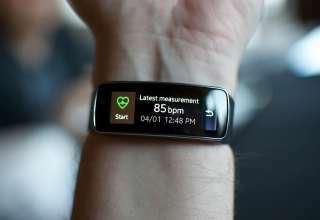 The bands have a combined weight of over 320 pounds, which is more than the average person will be able to use. If you’re just starting off, it’s important to stay safe and not overexert yourself. If you want a complete set of resistance bands, the Bodylastics 28 PCS set is an excellent option. It gives you enough bands for weight training of any kind, and the bands will last a lot longer than many of the competing brands. The package is very popular with users everywhere, and the 28 PCS receives a score of 5 out of 5 over 85 percent of the time. If you’re not a fan of the traditional resistance bands, the resistance loop offers an alternative design that’s less complicated than normal bands. The Resistance Loops come rated for five different weights: light, medium, heavy, extra heavy, and extra-extra heavy. The Resistance Loop bands are very easy to use. You don’t need to attach anything to the loops to get started. All the loops can be used right out of the box without any setup or other steps. If you’ve never used resistance loops before, these are a good way to get started because they’re simple to use. The Resistance Loop bands are much less likely to break than standard resistance bands, because there are no weak points in the design. All the points where the band meets fabric and metal are points where the design can rip or fail. The Resistance Loop eliminates this problem by being completely self-contained. The different resistances for the bands are not measured in pounds, which can make workouts frustrating if you want to record your progress. It can be difficult to tell the difference between some of the color-coded bands, because some of the colors are very similar. The Resistance Loop bands are a favorite among fitness enthusiasts everywhere. Over 90 percent of all reviews give the Loop a rating of 5 out of 5. If you’re looking for a great alternative to the standard bands, give the Resistance Loop a shot. Similar to the Resistance Loop design, the Aylio Loop Fitness Bands ditch the traditional resistance band design in favor of a simple loop. Unlike the Resistance Loop, the Aylio focuses solely on leg muscles. Most strength training programs can only offer limited results for your lower body, which is where the Aylio comes in. The Aylio Loops are designed specifically for helping your legs reach peak physical condition. It can be difficult to work out when you’re traveling, but the Aylio is very easy to transport and it can be used anywhere. The band’s total weight is only a few ounces, and all of the bands can fit into your pocket. The Aylio Loops are very simple to use compared to regular deadweights and resistance bands. All you have to do is loop them around your thighs and you’re ready for your workout. The package comes with a booklet that will walk you through some basic exercises, and the Aylio Loops can be incorporated into other exercise that you would normally do with dumbbells. The resistance bands don’t come in many weights. Only three bands are available with this package. This is one of the most popular products currently produced by Aylio Fitness. Most customers give the Loop Fitness Bands a rating of three out of 5 or higher. 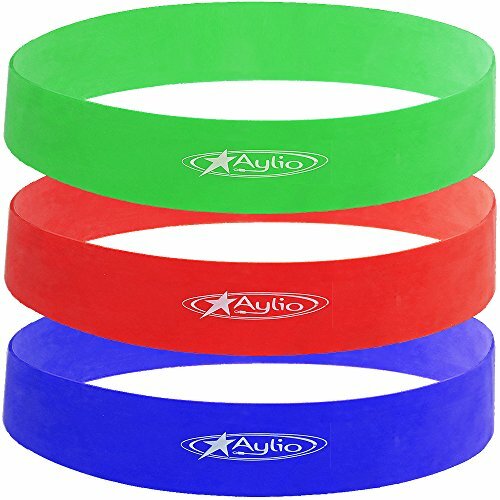 If you’re looking for a reliable set of resistance bands, the Aylio bands are a great option. First, figure out what kind of resistance bands you’re looking for. You can always go with a traditional ABS and Latex design that includes separate handles and pads, or you can go with a simple loop design. After you decide on what kind of resistance bands you want, figure out how many you’ll need to have a complete workout. If you’re shopping for multiple people, be sure to check out the large packages of resistance bands. to lose a little weight and tone up their abs. they also cost much less than a gym membership, which makes them an attractive option for many people. exercise that you do for the best effects. This requires you to attach the band to a fairly high anchor point, allowig you to pull on it from below. Now, get on your knees with your back to the bands and grab them, pulling them slightly over your shoulders. Engage your abdominals and, whie keeping hold of the bands, crunch down towards your hips while contracting your abs. Do this 10 times to make a set. This one starts off very similar to the kneeling crunch, as you need to attach then band to a high resistance point. However, instead of getting on your knees, simply lower yourself onto one knee, with your other foot flat on the floor with your thigh parallel to the floor. Now, grab the band over the shoulder that is on the same side as your raised knee and pull it towards the lowered knee and back in one smooth motion, engaging your core as you do so. Do this 10 times for each side of your body for best effects. Anchor the band on a fairly low support and lie on your back. Lift your legs and bend your knees 90 degrees. Your feet should fit comfortably into the band from this position, so if they don’t you need to adjust the band’s height. Once comfortable, simply bring your knees inwards, pulling them towards your shoulders while keeping your back straight and your abs right. Repeat this 15 times to make a set. This one is nice and easy. Simply secure the resistance band on a fairly low anchor and lie on your back, with your feet flat on the floor and knees raised. Now grab the band with both hands and start doing crunches, keeping your core tight and ensuring your head and shoulders are lifted from the mat with each crunch. Repeat this 15 times to complete a full set. By combining every one of these exercises, you should find that you are able to tighten up your core and start really working those abs in no time at all. However, they also require you to put a lot of pressure on your band, so it is important that you only buy the best resistance band available in order to be able to execute all of these exercises properly and with the least amount of risk to yourself.